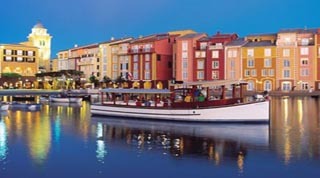 Disney's All-Star Movies Resort Holidays offer a fun and exciting vacation right in the heart of the Walt Disney World Resort Florida. Celebrating the magical history of Disney movies, you will be surrounded by giant characters from classic films such as Fantasia, Toy Story, 101 Dalmations and Herbie. 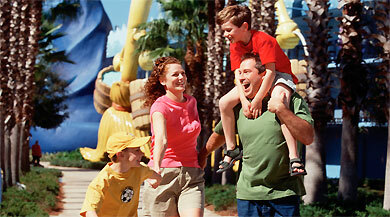 The resort offers comfortable rooms at value rates for individuals to large families. Many rooms have refrigerators to keep drinks and snacks cool. Balconies are available for those wanting to view the park from their room. 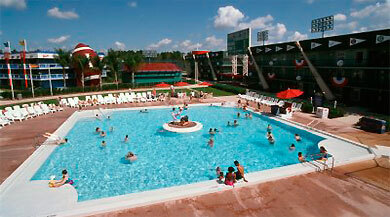 And, of course, there are all of the amenities of Disney resorts- pools like the Fantasia pool with Mickey, or The Mighty Ducks pool. 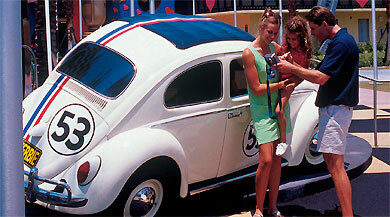 A huge gift shop will save visitors time in the parks for rides and shows instead of shopping. 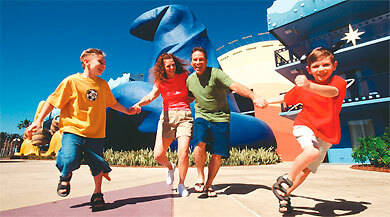 There are play areas for the family to enjoy and everywhere, Disney characters stand larger-than-life. The Toy Story building has a huge Buzz Lightyear ready to greet guest while Woody watches. 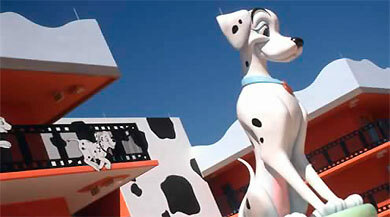 Dalmation puppies run along the railings at the 101 Dalmations building while Perdita and Pongo watch over them. Magical mops carry buckets outside the Fantasia buildings. 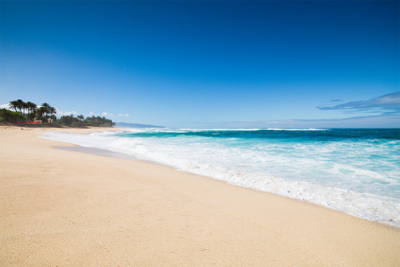 Sandy areas with slides and play houses, video arcades, and a full-size pool and a splash pool call for the kids to come and play. 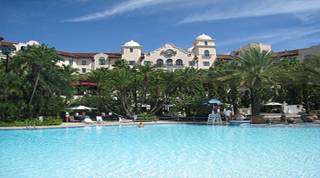 Grown ups and children will enjoy the outdoor movies beside the Fantasia pool starting at 9 pm. 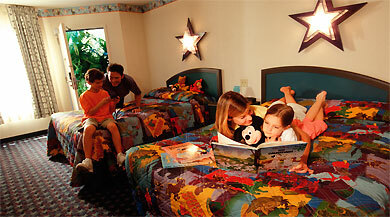 And do not forget the Disney channels in your room- perfect for watching while the adults get ready in the mornings. When its time to eat, this resort offers a great food court. The World Premier Food Court has wonderful fluffy Mickey Mouse waffles, bacon and fruit for breakfast, spaghetti and meatballs for lunch and turkey with gravy, mashed potatoes and mac and cheese for supper- and thats just a suggestion! There is something to please any palate. The staff go over-the-top to accommodate food allergies and picky eaters, too. For adults- the Silver Screen Spirits Pool Bar is the place to wind down the day with conversation over a glass of wine or a draft beer. Nobody is left out at this resort. As a Walt Disney World Resort guest you get complimentary access to the full Disney transportation network of buses and the famous Disney monorail. 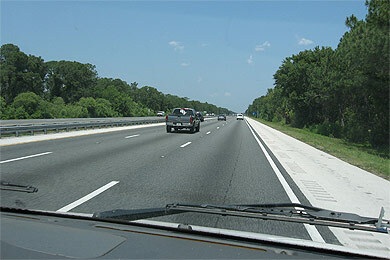 Transport runs continuously to all Disney theme parks, water parks and to Downtown Disney and Disney Boardwalk.